Pune: Twenty-two-year old Rahul Krishnakumar Vaid was arrested by the cyber crime cell of Pune police last Friday from Gurgaon in Haryana for posting vulgar content about Congress president Sonia Gandhi on social networking site Orkut. Why Sonia Maino was not arrested when she openly bought MPs for Crores. 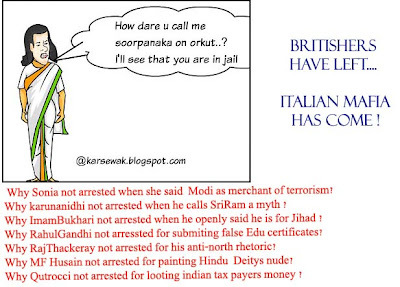 Why Sonia Gandhi was not arrested for Maoist Violence aided and abetted by her and her Vaticuntist Mafia masters. WOULD ARREST SUFFICE THE GREVIOUS INJURY TO INDIA??? ?